Says Retro Computers Limited debt collection is still happening – but where's the money gone? Updated Crowdfunding website Indiegogo has said it will continue its process for calling in debt collectors as another product delivery deadline sailed past for flailing ZX Spectrum reboot firm Retro Computers Ltd. This time the deadline was imposed by Indiegogo, which told RCL to deliver a production-ready Vega+ console to its US HQ by yesterday. The crowdfunding website handed RCL that deadline at the start of June, as we reported. The Vega+ project has become a global symbol of crowdfunding's murkier side, with Indiegogo itself falling under the spotlight as irate customers that invested money in the crowdfunding scheme more than two years ago look to the platform to step in and sort out the mess. In addition to proving that the Vega+ exists, RCL was told by Indiegogo last week to give them contact details for a representative of Sky, which holds the commercial rights for the use of the Sinclair brand name. According to the crowdfunding platform, these demands were not met. This week, we will be working with a collections agency to attempt to recoup funds disbursed, in an effort to be able to refund backers. Please note that, while we are pursuing collections, this process can take considerable time and the Vega+ team still has the opportunity to fulfil on their obligation of shipping the consoles to backers. RCL chairman David Levy told The Register: "We suggested that we demonstrate to their London-based representative in order to expedite one of the points they have requested us to address. Their response, without further contact or clarification, was to issue the statement quoted from [above], which is a distortion of our response." Reading between the lines, it appears Indiegogo has done little about the passing of another deadline – ironically, given RCL's own behaviour over the past two years, while making a statement intended to give the impression that action is now being taken. Five days ago a company spokesman assured The Register that it had already "begun the process of sending the campaign owners to collections". "Our Trust & Safety team is now continuing the process of sending this campaign to collections in an effort to return funds to backers. During this time, the campaign owners are still able to pursue fulfillment of the project and they are not prevented from shipping any units that are ready to be sent out to backers." Our current position is that we are still determined to deliver to backers ... Statements such as today's one from Indiegogo are, of course, highly destabilizing for our company and the Vega+ project. El Reg has also seen a rambling 1,700-word statement on the RCL Facebook page which blames everyone except Levy and his co-director Suzanne Martin for failing to deliver the allegedly production-ready console over the past two years. Regular readers will recall the ZX Spectrum Vega+ saga began two years ago when RCL was under different management. The console, offered as a handheld modern take on the venerable old ZX Spectrum and bundled with 1,000 pre-loaded games, was funded to the tune of more than half a million pounds by nearly 5,000 individual customers using Indiegogo. The project fell off the rails big time when RCL's original management quit amid an internal rift. Since then the Vega+ scandal has consisted entirely of hot air, broken promises and bitter recriminations flying hither and thither. Indiegogo was stung into action after one irate customer who had had his refund requests ignored took RCL to court and won. Most worryingly for the crowdfunding platform, the judge at Luton County Court ruled that a contract of sale had been formed through the wording of Indiegogo's payment receipt systems. This introduced a level of legal liability that called the whole Indiegogo business model into question; it advertises itself as a platform for speculative investments where money can be lost, rather than traditional sales of products. Its internal systems record "orders" that are placed, a word which District Judge Clarke placed emphasis on in his judgment. As Indiegogo's latest public statement revealed, the crowdfunding platform has decided to send in debt collectors to "attempt to recoup funds disbursed [by RCL], in an effort to be able to refund backers". The Register has seen a copy of RCL's bank account statements that were filed as evidence in the successful refund court case mentioned above. Its published accounts, as held by Companies House, state the firm had capital and reserves of £433,008 on 30 March 2017, with total assets stated as being worth £760,945. The company bank account for that date had a stated balance of £1,210.31. As a legally defined micro-entity, RCL files abbreviated accounts with very little detail. It is, of course, possible that RCL has more than one bank account though the firm's two active directors did not respond to The Register's invitation to comment on its finances. Former director Paul Andrews told El Reg that the firm had one bank account and one PayPal account when he left in 2016. 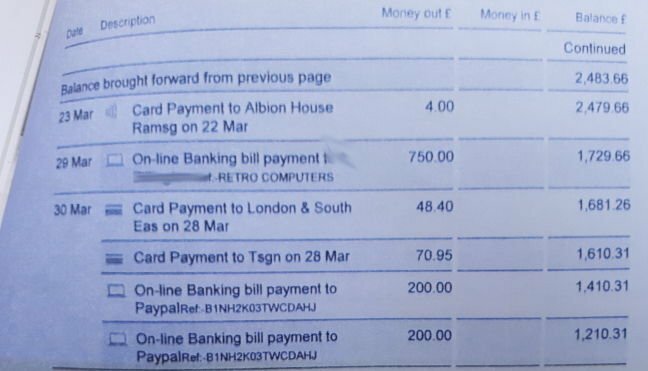 Entries in the statements seen by us suggest money in this RCL bank account was regularly moving to and from unspecified PayPal accounts during the March-April 2017 period, as well as cash top-ups from an account recorded in the statements as belonging to "Suzanne Louise Mar", who appears to be the company MD Suzanne Martin. David Levy also received money from RCL during the same period. Another item of note in the bank statements seen by us include an entry titled "Direct credit from Hmrc VAT Repay" [sic] for £15,994.45, paid in on 25 May. Immediately prior to that, the account balance was in the red to the tune of £3,094.11. A petition set up by empty-handed RCL customers records 118 people who claim to have unsuccessfully asked for a refund at the time of writing. The site totals their refund requests at £14,550. An Indiegogo spokesman has contacted The Register since publication to contest Dr Levy's assertion that RCL had offered in good time to show off a console to an Indiegogo rep in the UK. "The offer from the campaign owners [RCL] to demo a unit in London came after they already missed the deadline Indiegogo set," the crowndfunding platform's PR man told us.